Of drones and assault rifles? Twelve people are gunned down and 70 are wounded in a movie theater in Colorado, gun nuts scream about their rights to own whatever kind of weapon they want and rush out to buy assault rifles and high capacity magazines; Twenty-six people, including 20 first graders, are massacred in an elementary school in Connecticut, the same gun nuts become hysterical about their Second Amendment rights and start throwing around words like “revolution”. 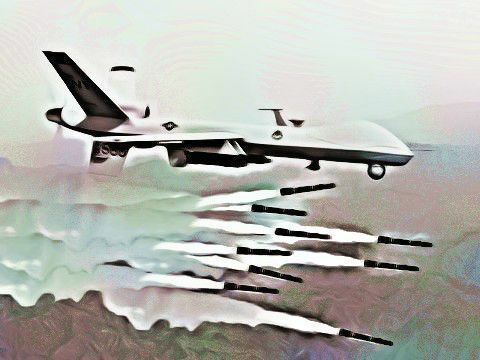 The United States Attorney General says under “an extraordinary circumstance” the government might use drone strikes against its own citizens on U.S. soil, and now suddenly the exact same whack jobs are anxious about enacting legislation concerning what weapons can and cannot be used in the United States. It seems the right for people to own weapons capable of murdering 20 six and seven-year-olds in a matter of minutes is OK, but targeting domestic terrorists is an outrage? Both are offensive and wrong, it’s time for Republicans, Libertarians and Tea Party types to pull their heads out of their collective fourth point of contact, to grow up and start acting like adults. The Constitution no more guarantees your right to own assault rifles and high capacity magazines than it provides for the Federal Government to target citizens to a blazing death from above.